Throughout all of the games in the Metro series, one of the consistencies is how deep they go in to the graphics. Every time, the graphics look ahead of their time, and this game is no exception. With the current 4K craze, we will be bringing to you all of the specifications for playing this game, along with the crazy requirements for 4K. This game is single handedly the reason that I am upgrading my system, which has been getting a little on the outdated side. If you want to run the game in 1080p @30FPS, you would need to have at least 2GB of VRAM, which as a GTX 1060 or Radeon HD 7870. You CPU would at least need to be an i5-4440 or equivalent. 8GB of RAM is recommended to play at console level. You can be on Windows 7, 8, or 10. For 1080p @60FPS, you need 8GB of VRAM! This is crazy high for 60FPS in any game! Because of the high VRAM requirement, you will need to have a GTX 1070, RTX 2060, or Vega 56. Wow! The CPU has to be an i7-4700K or equivalent. The RAM is still at 8GB, like the minimum settings, but for this game you have to be on Windows 10. If you want to play at 1440p @60FPS, you need to have 8GB of VRAM, but with high card specifications, clocking in at a 1080ti, RTX 2070, or Vega 64. These are crazy expensive cards, with a 1080ti going for around $800 at the moment. The more reasonable choice would be to use the 2070 if you care about 1440p, as this card has the same ammount of power, ray tracing, and a lower cost. The reason the 1080ti is so expensive is because it is not in production any more, and only available on the resale market. You would need an i7-8700k or equivalent, and 16GB of RAM. Like 1080p @60FPS, you will need to be on Windows 10. 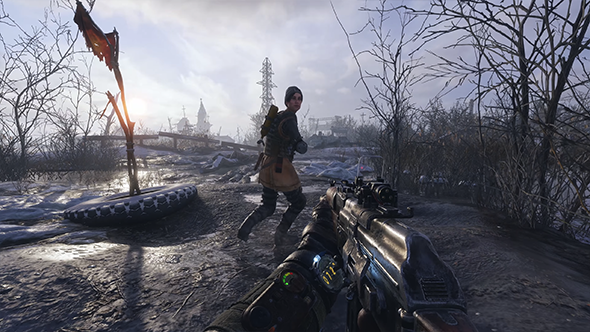 For those who wish to play Metro Exodus in 4K @60FPS, you will need a 2080ti with 11GB of VRAM. That’s it. This is the only card that is capable of playing Metro Exodus at these high settings. A 2080ti is easily the most expensive gaming card on the market right now, going for around $1400 on Newegg. You will need an Intel Core i9-9900K, which is the most expensive processor on the market right now, starting at around $530. You need 16GB of ram, and the Windows 10 OS. None of this takes into account the ray tracing elements, powered by the new line of RTX cards. It has been said to cut your frames in half, and I am not sure if 4K with ray tracing would even be a worthwhile pursuit. While these may be very high requirements, the game looks absolutely stunning, and will break the graphics boundary for gaming. I personally will be holding off on playing through this game until I get my new system, so I can play at higher than 30FPS. Don’t even get me started about how this game will possibly work on consoles, though.